Genuine Polished Billet Aluminium POWER STEERING PUMP TO FIT SBF-289,302,351 and all variants together with FE 390,427and 428 and Early 6 Cyl engines. NB: THIS PUMP IS NOT AVAILABLE OR SOLD ANYWHERE ELSE THAN BY OUR COMPANY. This Unit includes a BRAND NEW USA Factory sealed Power Steering Pump backed with full factory warranty, so buy with confidence. Together with the Precision CNC-machined solid billet 6061-T6 aluminium bodies they are then assembled in our workshop to strict tolerances to ensure long life and reliability, these Pumps fit perfectly and handle high torque and vibration easily. 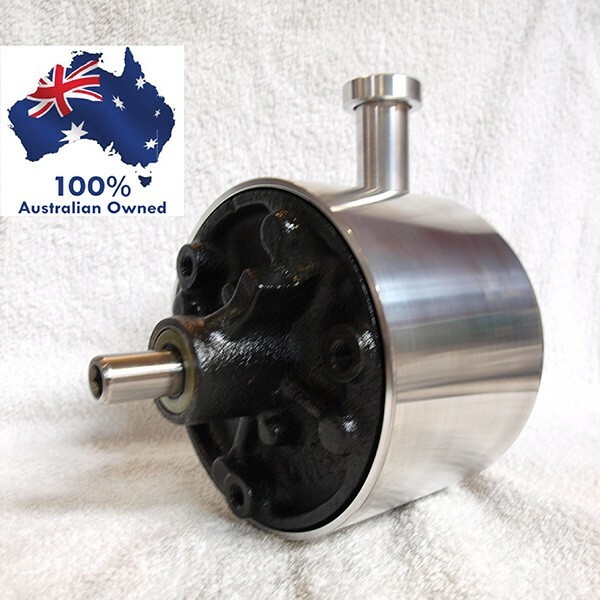 They replace your ugly Early Ford power steering pump canister with a phenomenally styled Polished aluminium billet reservoir. These are the perfect accompaniment to our bracket kits. Available as a complete bolt in replacement for Early Ford press on pulley pumps using your existing hoses and fittings. Nothing else apart from fluid is required. There may be slight modifications to factory style brackets required. These units carry a 90 day unconditional warranty against faulty manufacture or pump failure.